Why another one of those strange twisty gastropods from the Pliocene of Cyprus for our Fossil of the Week? Because this one fooled me for years. 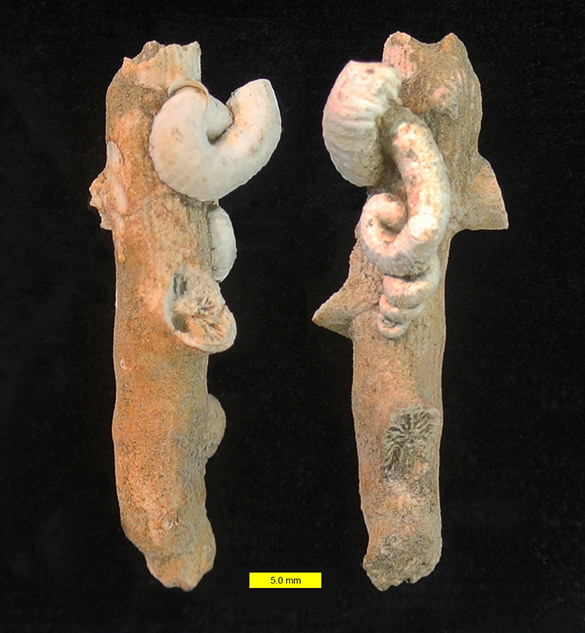 Above is a pair of images of a specimen of the vermetid gastropod Petaloconchus intortus (Lamarck, 1818) from the Nicosia Formation (Pliocene) of central Cyprus. It is encrusting a branch of the coral Cladocora. 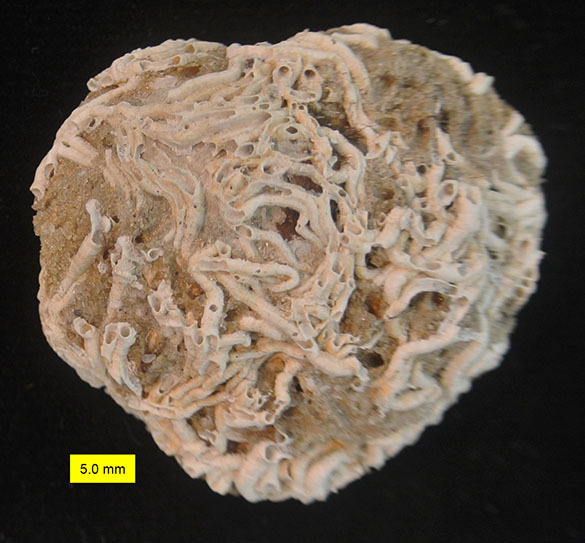 Ever since 1996 I’ve cataloged this and other such Cypriot specimens as serpulids, a type of polychaete worm that constructs adherent calcareous tubes like these. In fact, I placed on Wikipedia an image of the specimen below as a serpulid example. Last week an anonymous editor on Wikipedia changed the caption on my image from “serpulid worm tube” to “Petaloconchus“. I did some research and yes, he or she was correct. I’ve since remade the image and updated all the Wikipedia pages where it appeared. This is not the first time I’ve posted a fossil image online and been corrected, and I hope it’s not the last. Such feedback and criticism is a major advantage of online science, and I learn a great deal. The Vermetidae (worm gastropods) probably hold a record among molluscs for the degree of confusion they have promoted, both in collections, and in the literature; for they have been misconstrued at every level from subspecies to phylum. Etymology.–alaminatus to recognize key feature of the absent internal laminae. The Linnean name is a paradox, as Petaloconchus means laminate shell (the supposed, but inadequate, definition of the genus), while the subspecific name alaminatus negates this characteristic feature. But who ever denied either nature’s complexity or evolution’s capacity to eliminate structures? 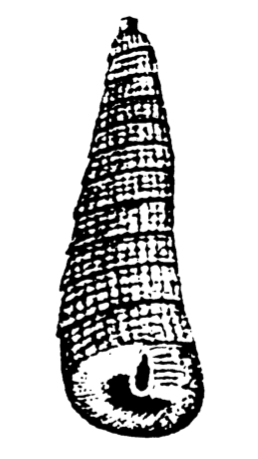 Original image of Petaloconchus sculpturatus by Lea (1843). Above are some real serpulid worm tubes from the Pliocene of Cyprus, although I’m open to corrections! Aguirre, J., Belaústegui, Z., Domènech, R., de Gibert, J.M., and Martinell, J. 2014. Snapshot of a lower Pliocene Dendropoma reef from Sant Onofre (Baix Ebre Basin, Tarragona, NE Spain). Palaeogeography, Palaeoclimatology, Palaeoecology 395: 9-20. Bradley, E.S. 1931. 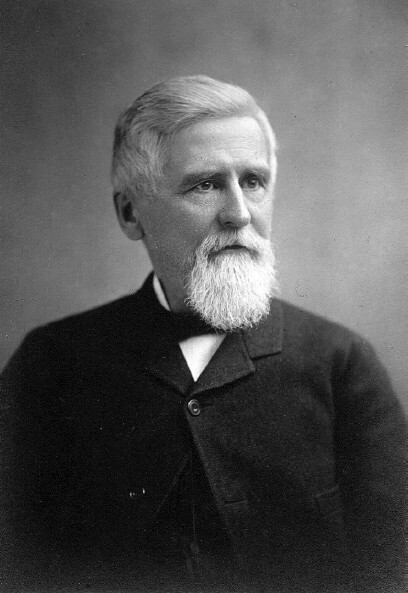 Henry Charles Lea. A Biography. Philadelphia, University of Pennsylvania Press, 418 pages. Carpenter P. 1857. First steps toward a monograph of the recent species of Petaloconchus, a genus of Vermetidae. Proceedings of the Zoological Society of London 24: 313-317. Gould, S.J. 1994. 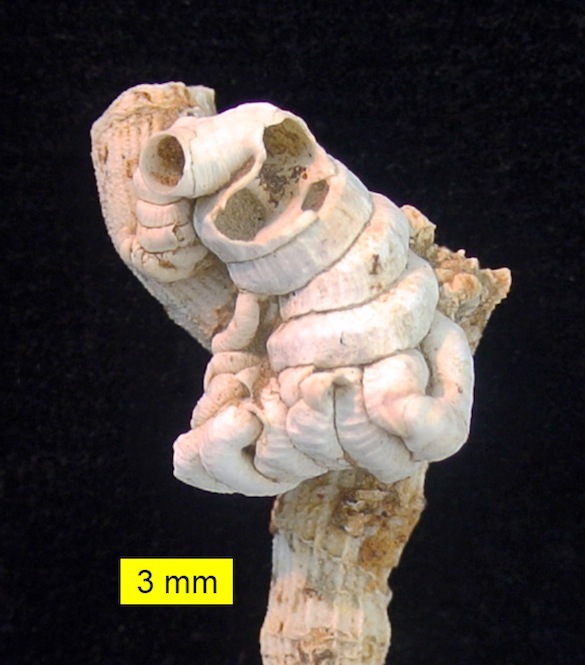 Petaloconchus sculpturatus alaminatus, a new Pliocene subspecies of vermetid gastropods lacking its defining generic character, with comments on vermetid systematics in general. Journal of Paleontology 68: 1025-1036. Keen, A.M. 1961. A proposed reclassification of the gastropod family Vermetidae. Bulletin of the British Museum (Natural History), Zoology, 7:183-213.